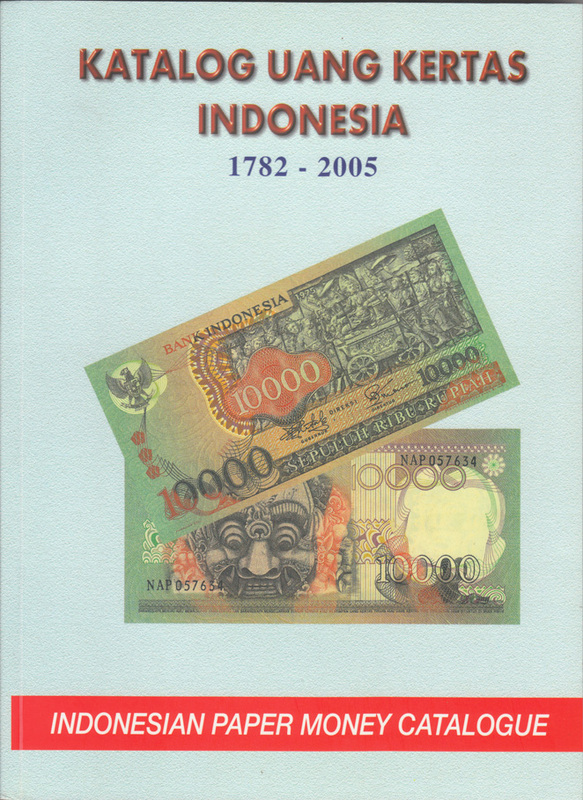 The Katalog Uang Kertas Indonesia 1782 – 2005 (KUKI) is considered to be the most complete catalogue providing an overview of all paper money that circulated in Indonesia since 1782. Early 1991, a beautiful picture book was issued by Yayasan Serangan Umum 1 Maret 1949 & Perum Peruri Jakarta, called “Banknotes and Coins from Indonesia 1945-1990” (BCI). The books gives an overview of paper money with nice photo’s of the various periods in Indonesia’s history. The KUKI is extensively used by collectors all over the world and has become the standard for the more specialized collectors. When a catalogue becomes a de facto standard, one assumes that the contents is (historically) correct and the intentions of the author are genuine. Unfortunately this is not the case with the KUKI. The catalogue contains many pictures that are digitally manipulated photo’s of the paper money that is also shown in the earlier mentioned book BCI. In at least 15 cases the photo’s in KUKI are digitally repaired and significantly upgraded, where damages, holes and stains were removed and paper money notes are presented in a much better condition than the original notes. In some cases where specific parts of paper money notes were missing, in the KUKI they appear complete again, meaning that the author has used his immagination to re-create parts of the note. Sometimes this might even have happened without a real example, thus providing the collector community with self invented parts of paper money designs. In several cases the serial numbers of the notes shown in KUKI are changed. This concerns most often the last one or two numbers. They are replaced by numbers that already occur earlier in the serial number. When digitally manipulating pictures it is most easy to re-use an existing number in a serial number to replace another number. The photo in KUKI on page 19 is also shown in BCI on page 224.Although the BCI picture shows various part missing and many stains and holes, the KUKI picture is obviously in a much better condition. Another interesting thing is that the serial number on the BCI note is 1638, but on the KUKI picture it is changed into 1666. The photo’s in KUKI show banknotes with serial numbers that usually are within the range used for “SPECIMEN” banknotes. It seems that the author has digitally removed that “SPECIMEN” overprint on the obverse of the shown pictures. The picture of the obverse of the 40 Gulden note on page 53 still clearly shows the “SPECIMEN” overprint on the reverse shining through the obverse. You can still clearly see the “N” underneath the 3 of the left serial number. The poor quality blue pictures in KUKI on page 190 are the same pictures of the same notes as printed on page 90 and 91 of the BCI. All details in the pictures are the same in both books, however the serial number in KUKI is different again. In KUKI the last number of the serial number has been digitally replaced by a number that already occurs earlier in the serial number. The paper money note shown in KUKI on page 206 is the same note that is printed in the BCI on page 94. Although the BCI photo shows that several pieces are missing and damage by a paperclip, the KUKI photo shows an almost perfect banknote. The KUKI author has digitally repaired the note and drawn a design where a piece was missing in the original note. The note printed in KUKI on page 212 is the same note that is shown on page 95 of the BCI. The serial number in the BCI is printed with blue ink, however the serial number in KUKI is black. Both notes printed in KUKI on page 265 are the same notes as shown in the BCI on page 121. The KUKI shows the notes in a much better quality because several folds and damages have been electronically removed and the missing corner pieces have been digitally restored. The note in KUKI on page 266 is the same note that is printed in the BCI on page 122. The KUKI shows a picture of the note with perfect corners where the BCI shows the notes with large parts missing of the left and right top corner. This KUKI picture of this note is substantially digitally manipulated. The note shown in KUKI on page 285 is the same note that is printed in the BCI on page 113. Although the BCI picture shows a note with holes, paperclip damage, large stains on the left side and damages on the right side, the same note in the KUKI shows an almost perfect note that is digitally significantly upgraded. The note printed in the KUKI on page 297 is the same note that is printed in the BCI on page 131. The original serial number 69335 of the BCI note is digitally changed to 63333 in the KUKI picture. An action like this makes the collector believe that a note with this serial number exists, while reality might be that such a number has never been issued. The note shown in the KUKI on page 303 is actually the same note that is shown in the picture in the BCI on page 135.Several damages and folds have been electronically removed in the KUKI picture and the original serial number 4009 of the BCI note has been digitally changed to 4999 in the KUKI picture, making the collectors believe that such a number really exist, while reality might be that this specific number was never issued. When a catalogue contains many intentional errors and manipulations such as described above, it is justified to be suspicious about the complete content of the work. It seems that the objective of the author was to provide the collector community with and attractive catalogue that contains much content and many pictures. It also seems that the author did not have the intention to provide a historically correct overview and deliberately provided false information for a purpose other than correctness. With so many intentional errors, collectors should seriously doubt the correctness of the KUKI, especially when it concerns decisions about paper money that is scarce and valuable. Let’s hope that one day, a catalogue will be issued with genuine intentions….